I’m impossibly busy tonight, so unfortunately, I have to rush through this post (as much as I’d like to do anything BUT rush). I’ve got tons of cooking going on! Oh, I know — this is ME we’re talking about. I’ve always got tons of cooking going on. But seriously, I have a lot of things to take care of in the kitchen, as well as everywhere else in the house, because I am GOING AWAY FOR A FEW DAYS. I’ll let the shock sink in. Yes, the RRG Mom is skipping town, and I’m taking L. with me. We’re having his first major adventure — a trip to New York City to see my inimitable sister, D., who is definitely one of L.’s favorite people in the whole world. She promised him, long ago, that when he turned five years old he could come to visit her for a weekend, and of course he remembered…so now that he is five, he and I are hopping a train to Brooklyn and have a full itinerary planned for our fantastic adventure. L.’s asked to spend a whole day at the Museum of Natural History, including a trip to the planetarium (he’s a budding astronomer these days); he’s asked to see the beautiful Brooklyn Botanic Gardens; he’s planning to learn about bats at one of the local zoos; and of course, he’s being taken out for a very grown-up dinner by Mommy and Aunt D., at a wonderful neighborhood restaurant just blocks from her apartment that serves entirely local, organic, amazing food. Between now and the big trip, I’ve got to get everything in shape here at home so that J. and P. can have a stress-free bachelors’ weekend. J., despite his many contributions to the world, is a TERRIBLE cook — the poor guy just figured out grilled cheese not too long ago. So as much as I’d like to sail out the door with a carefree wave, I know I’ve got to get cooking so I can leave some food that won’t require any fuss, and that will please them both while L. and I are gone. At the moment, I’ve got a big pot of marinara on the stove from tonight’s dinner, which will transform into pizzas for the kids’ lunches tomorrow and into creamy tomato soup for J. and P.’s Saturday night meal. I’ve got chicken stock working in the slow cooker, and when I’m done blogging, I’ve got to mix up the pizza dough for an overnight rise; in the morning half of it will become lunches, and the other half will be filled with chopped roasted broccoli and left in the fridge with instructions for J. to make chicken-broccoli pizzas on Sunday. The marinara and broccoli are handy shortcuts, since they’re both byproducts of tonight’s dinner — the first of my two $2-per-person meals. 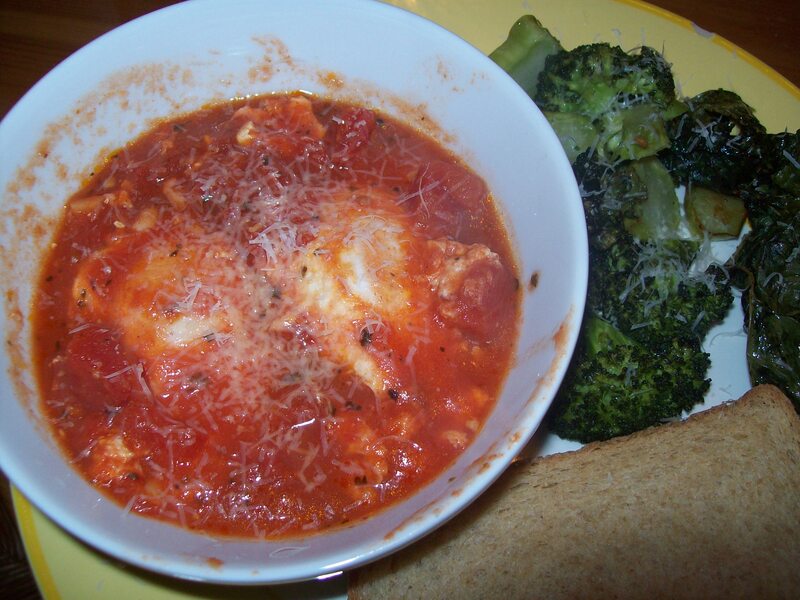 We had Tomato-Poached Eggs with a side of roasted broccoli and kale, and toasted whole wheat bread for dipping (this is a dinner that DEFINITELY needs some good sopping bread, in my opinion). I have to say, ever since a good friend of ours mentioned the idea of poaching eggs in marinara sauce, I’ve been hooked — it’s a delicious revelation. The sweet tomatoes, the hint of spiciness from garlic and the crushed red pepper I always put in my sauces, and the rich, silky egg yolk swirling throughout like a sauce within a sauce…oh, yeah, you’ll want that bread. And some good hearty greens to contrast and stand up against all that richness. Bingo — right on target, at exactly $2 each for the four of us. It’s a filling, delicious meat-free meal, and frankly, if I’d gotten non-organic ingredients it would have been much cheaper. And with plans for the leftover bits in place, I’m stretching even these meager dollars into something even greater. Humble ingredients like eggs and tomatoes and rough greens can be transformed into amazingly rich food; better yet, this dinner came together in only about 25 minutes. Healthy, low-cost, fast, and simple. What could be better? This entry was posted in Accountability, Cooking, Feeding kids, Meal planning, Parenting and tagged cooking, family, feeding kids, food, Household organization, kids' health, meal planning, milestones, parenting, recipes. Bookmark the permalink. 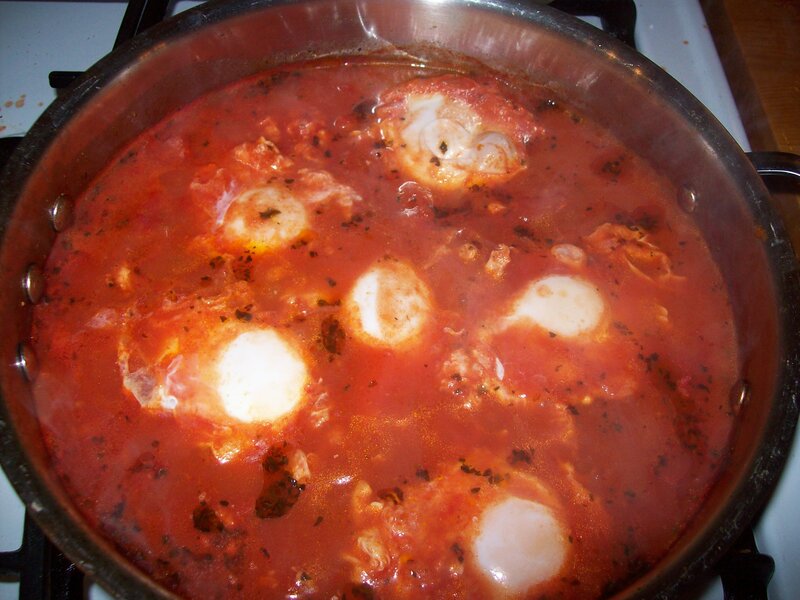 The first time i poached eggs in tomatoes it was because of a Dom Deluise cookbook – totally random. It was so good and I haven’t made it in forever! Such a cost effective meal. I wish I could get kale for a buck around here! I’m really glad to hear from so many people who have done the tomato-poached egg thing before and completely get why it’s such a great meal! For the record, it’s not that I got a whole ton of kale for a buck; I got a big bunch from our farmer’s market for about $3, and had about a third of it left, which I roasted up with broccoli to fill it out and make enough for us all to eat. So TECHNICALLY, I suppose you could say I got kale for $3, but only needed $1 of it for this meal. Either way, though, it’s really cost-effective, AND I think $3 for amazing pesticide-free local kale is a total bargain.